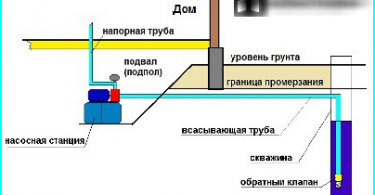 Farmland - a territory thateach owner can arrange according to their tastes and preferences. It does not matter, you have a large territory or have only a few hundred, any site can be turned into a cozy nook, a great place to relax among beautiful plants, which occupy a special place for the garden vines. The earth is always ready to share with a man of his clean energy and beauty, charging forces, cleansing and refreshing. 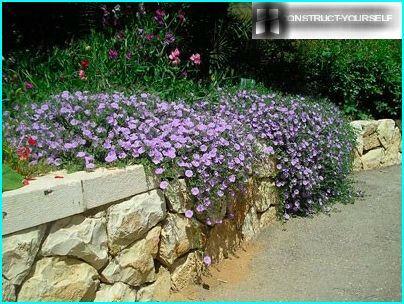 Liana will help to create cozy corners in the garden, secluded place to hide an unsightly fence or wall outbuildings. 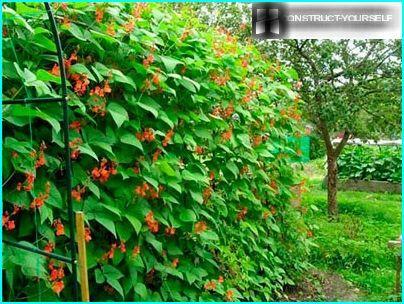 Pergola or gazebo, braided beautiful flowering vine, looks much more attractive, protected from direct sunlight, beckoning to relax in the shade of green leaves. A fence, decorated with vine, always beautiful and is visible from afar, causing the admiration of passers-by and neighbors. We will tell you about the vines, which grow in our climate is simple. Perennial flowering vines for the garden - a honeysuckle, clematis, climbing rose, Trumpet. 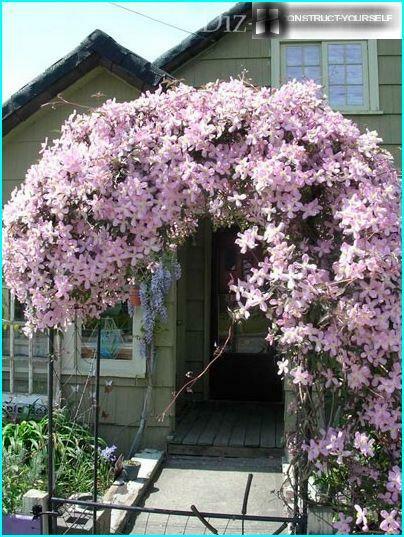 Clematis - the most common in Russiagarden vine. 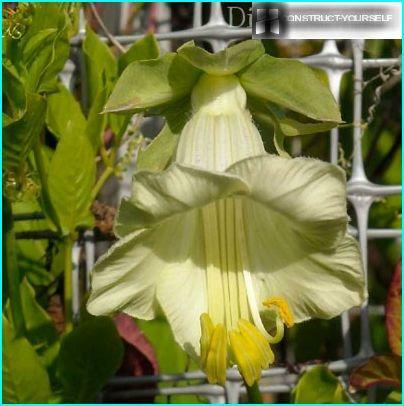 Breeders brought a huge amount of clematis varieties, among which Grandiflora and melkotsvetnye plants with flowers of various hues. This species is quite whimsical vines for clematis need special care, but its beauty is undeniable. He will even make a nondescript house cozy and appealing. 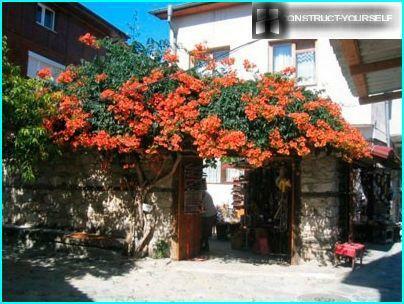 Pillar, porch, fence, braided stems with bright colors, zapestreyut colors, lifting the mood. Honeysuckle Perfoliate has become quite popular inour gardens due to its undemanding. This plant has two-tone raised to the sun blossoms with a wonderful aroma. 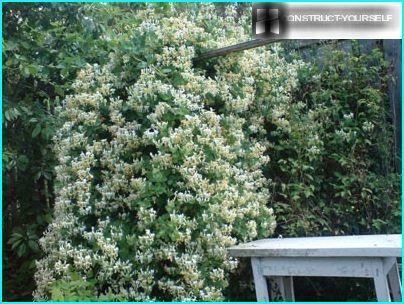 If you use the honeysuckle, to decorate the gazebo, in addition to the beauty of flowers, you can enjoy their scent. 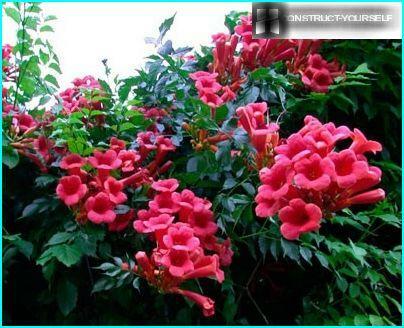 Trumpet - very beautiful blooming vine withred flowers in the shape of bells. Unfortunately, Trumpet rather thermophilic and can not always survive our harsh winters. In winter, the roots of the plants need to cover. But Trumpet grows well in the city, polluted air does not scare him. There are also yellow, purple, pink kapmsis, but the red - the most common variety. This tree creeper. Perennial plant has a stem and a luxurious flowering crown. Kamsis look equally good, if it shoots entwined pergola or fence, as long as he had enough sun. 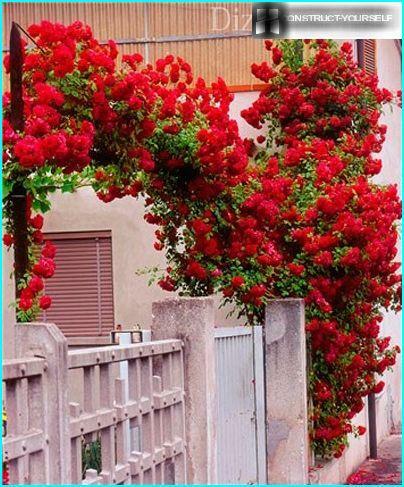 Climbing roses - decoration of any garden. For us it is about the same as that for the Japanese cherry. Admire these colors, they can contemplate the infinite. They bloom for a long time, abundant, they are not afraid of drought. Pergola, fence, bench and wall of the house - all this will be a good support for climbing roses. And take care of them is easy - buy and landed favorite shrub watered regularly and it is 2-3 times per season Feed the fertilizer. Attention! Metal supports some vines for the garden is poorly tolerated, and in the winter shoots are badly hit, so they should be used with caution, and to shoot shoots with poles in winter. 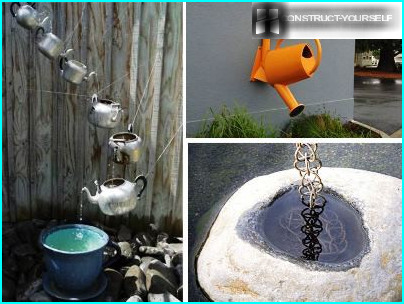 To refuse them is difficult because namely using metal poles, you can create the most beautiful arches. Ivy belongs to no curly flowering gardenplants. He is completely unpretentious, grows well in the shade. What place in the garden, you have taken him no, he will grow everywhere, but you need to ensure that the soil at the roots was always wet. Ivy loves moisture, forming a luxurious undergrowth. Shoots ivy firmly fixed on almost any surface, clinging to the slightest roughness. It is an evergreen plant, which normally transports winter without problems. Wild grapes - all known unpretentiousvine that can grow anywhere. Wild grape arbor shaded garden will make a solitary place, beautifully opletet fence, balcony or wall of the house. It begins to redden the leaves are especially beautiful in the fall. This vine does not require any support or special care. Council. Not flowering vines can be used as a backdrop for flowering. 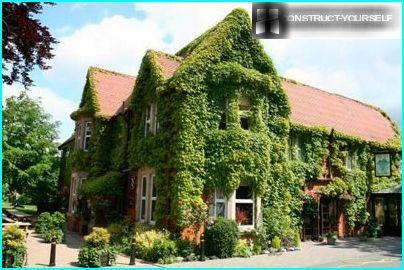 For example, against the ivy-covered walls would be advantageous to look any plant with bright colors. 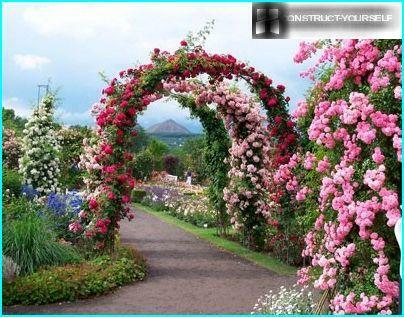 Decorative vines for the garden are bothperennial and annual. Perennial plants in a few years time to grow, securing a certain area of ​​the plot, and annuals can be planted every year in any pleasing you place - her soft bright colors, intricate pattern of leaves they will entertain the visitors during the summer. Annual vines for the garden, though living alla few months to grow very quickly. In just a few months Morning Glory, for example, is able to grow in length by more than four meters, decorating railing or fence for its beautiful purple flowers, resembling a gramophone. All the same age for the garden in need of support, you can fix the shoots length of 10 centimeters, so that later they are not messed up. All these plants require a large amount of light. So, to the annual climbing plants, which are able to transform your garden include sweet peas, morning glory, decorative beans and kobeyu. 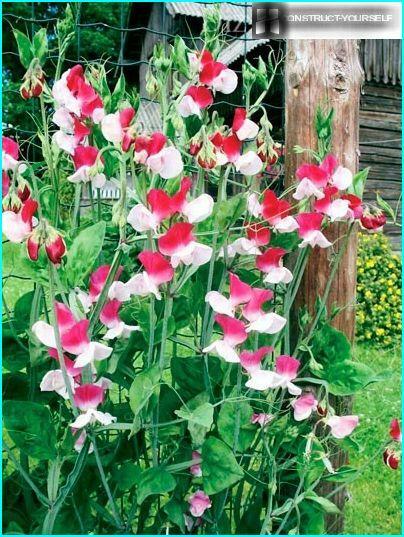 Sweet peas - very cute decorative option, it is good to use for decoration terraces, balconies, fences. The flowers smell good, and all sorts of bright colors pleasing to the eye. Bright purple morning glory certainly grammofonchikiIt is known to many. It grows quickly, blooms profusely all summer. 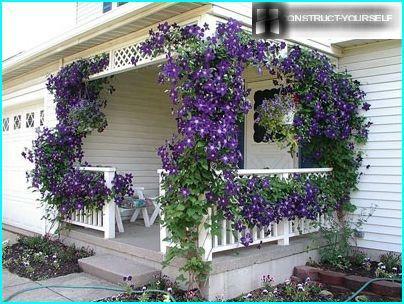 Ipomoea and decorate the gazebo and terrace, and a fence or hedge. There are also blue, pink and crimson morning glory. During this annual vine to look almost do not need, enough to make sure that the land does not dry at the roots. Decorative beans is good because it can grow in the shade. 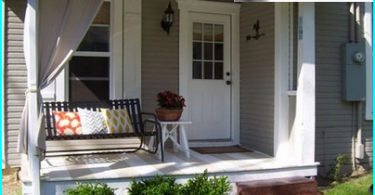 With it you can create a cozy green curtain that will protect a pergola or arbor. Usually it has red or white-red small flowers. Kobe - exceptionally beautiful annual gardenvine native to Mexico. Her long, graceful bells of green gradually become purple, blue or white. Kobe whimsical, requires special conditions and care, and does not grow at all. As a climbing plant in the garden can be used and hops - his "bumps" and tender greens will look good on any background. 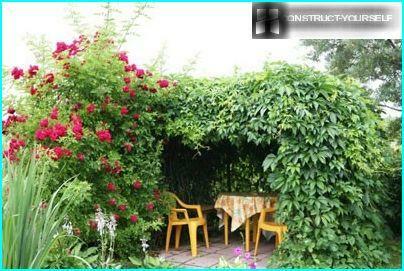 And the annual and perennial vines in the garden will doit more alive, fresh, full of natural colors and cozy. Except for a few species, it is easy to care for plants that do not require special attention.